The human hand is located at the end of the forearm, and it is made out of 27 different bones as well as two different muscle groups – the intrinsic muscle group and extrinsic muscle group. The bones of the hand include the carpal bones, the metacarpals, and the phalanges. Let’s take a more detailed look at the construction of the human hand, including the bones, muscles, nerves, and arches that make up the hand. The bones found in the hands and fingers include the carpals, the metacarpals, the proximal phalanges, the middle phalanges, and the distal phalanges. The metacarpals found in the fingers are the bones which make up the largest portion of the hand. They are located in between the carpals (see the wrist below) and the phalanges. The metacarpals all have the same shape, and the metacarpals in the middle finger and index finger move very little in comparison to the metacarpals of the little finger and ring finger. 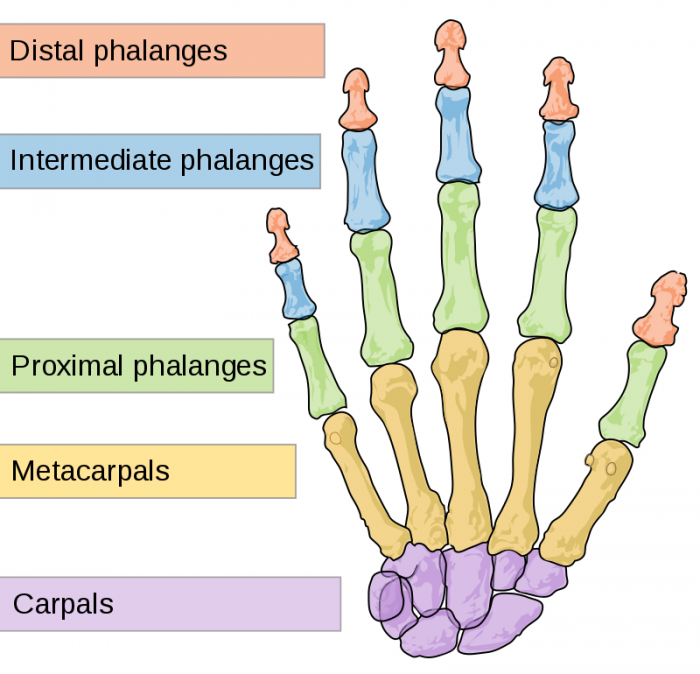 The proximal phalanges are the bones that directly follow the metacarpals. There are three phalanges in each finger, and the proximal phalanx is the largest out of the phalanges. The proximal phalanx has joints that connect with the middle phalanx and the metacarpal. The middle phalanx of the finger is second or middle of the three different bones in the fingers. The distal phalanx is the third or final bone in each finger, when counted from the base of the hand to the ends of the fingers. Because it is on the end, the distal phalanx only joins with the middle phalanx. The thumb, unlike the four fingers, is made out of only the distal phalanx, the proximal phalanx, and the thumb’s metacarpal. The metacarpal in the thumb is similar in general shape to the metacarpals found in the fingers. However, the metacarpal of the thumb is much thicker than those in the fingers. The thumb metacarpal also is capable of much more movement than the finger metacarpals. Because the thumb metacarpal is more mobile than the metacarpals in the four fingers, the thumb is able to bend in a way that allows for pinching and grasping. The mobility of the thumb metacarpal is largely due to how the trapezium and metacarpal link together. The thumb does not have a middle phalanx, only a proximal phalanx, and distal phalanx. The muscles found in the palm and the forearm must work in conjunction to keep the hand and wrist stable and aligned, yet permit movement. Tendons are fibrous flexible cords which attach muscles and bones. The tendons found in the arm and hands link the muscles in the arms to the phalanges, metacarpals, carpals, radius, and ulna. The tendons move the bones when the muscles contract. The tendons in the hand include the superficialis tendons, the extensor tendons, the flexor tendons, the extensor pollicis brevis, the pollicis longus, and the profundus tendons. Tendons attach the bones to the muscles of the hand and arm. The muscles which move the thumb and fingers are located in the forearm, above the wrist. Flexor tendons run from the muscles of the forearm down to the wrist and attach themselves to small points on the thumb and fingers. Whenever the fingers are straightened or bent, the flexor tendons move through the tendon sheaths, a tunnel which functions to hold the tendons along the bones. The flexor tendons diverge near the palm of the hand and from there, two of the flexors run to each one of the fingers while one flexor runs to the thumb. The extensor tendons are attached to the distal phalanges and the middle phalanges. The pollicis longus and the extensor pollicis brevis are two tendons which start in the forearm and run down through the wrist, letting the thumb move. The superficialis tendons are responsible for flexing the wrist along with the PIP and MCP joints, aided by the profundus tendons. These tendons are linked to the bases of the middle phalanges and they run through the wrist and hand along the palm side of the hand. Finally, the profundus tendons are also responsible for moving the PIP and MCP joints and they are attached to the distal surface of the middle phalanges. While tendons join muscle to bone, ligaments join bones together. There are six major ligaments in the hand, and they function to give stability to the wrist. These ligaments join the carpal bones and the radius together, and they also link the two different rows of carpal bones together. The ligaments that link the carpal bones together keep the bones in place while the wrist moves around. In addition to these small ligaments, a few larger ligaments are found on the sides of the wrist that keep it from moving too far in a given direction. These ligaments are collateral ligaments. The ligaments in the hand include the volar plate, the collateral ligaments, the radial and ulnar collateral ligaments, the dorsal radiocarpal ligaments, the volar radiocarpal ligaments, and the radioulnar and ulnocarpal ligaments. The collateral ligaments are found on either side of the thumb joints and finger joints. They are strong ligaments which prevent the joint from moving sideways. The ulnar collateral ligaments and the radial collateral ligaments function similarly, giving stability to the wrist by binding the bones of the wrist together and preventing too much movement. 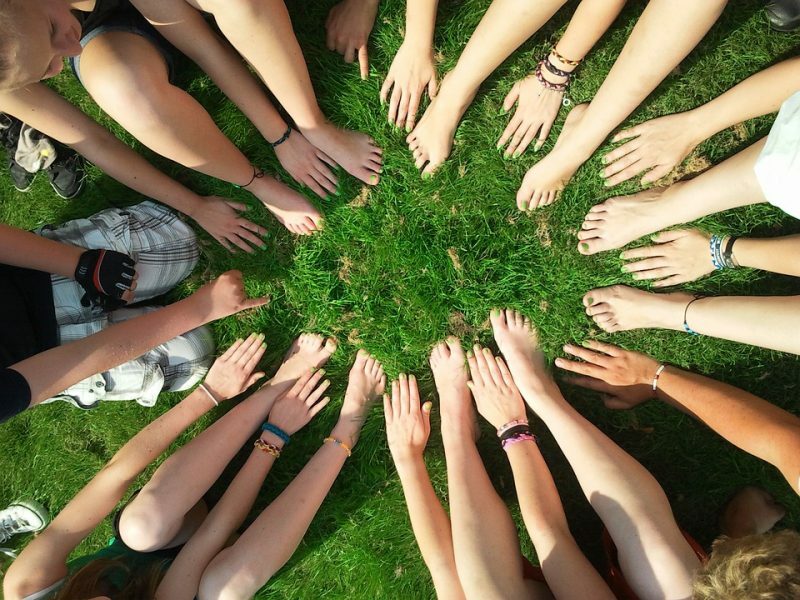 The radial and ulnar collateral ligaments are mainly what keep the wrist supported and functioning, although they are assisted by smaller ligaments that surround them. The dorsal radiocarpal ligaments function to give the back of the wrist support, while the volar radiocarbon ligaments support the underside of the hand, giving the palm side of the wrist stability. Finally, the volar plate tightens in order to keep the proximal interphalangeal joint from being bent backwards when the fingers are straightened. It connects the middle phalanx to the proximal phalanx on the underside of the hand. Joint capsules are sections of fibrous connective tissue which envelop the joints, and they have synovial membranes inside them. These synovial membranes produce a synovial fluid which lubricates joints and assists them in moving. Joint capsules also have an outer fibrous layer that protects and supports the joint. The outer layer of the joint capsule is made out of white fibrous tissue. Joint capsules are found at joints, such as in the knee, the hand has joint capsules located in the thumb and fingers in the finger joints. 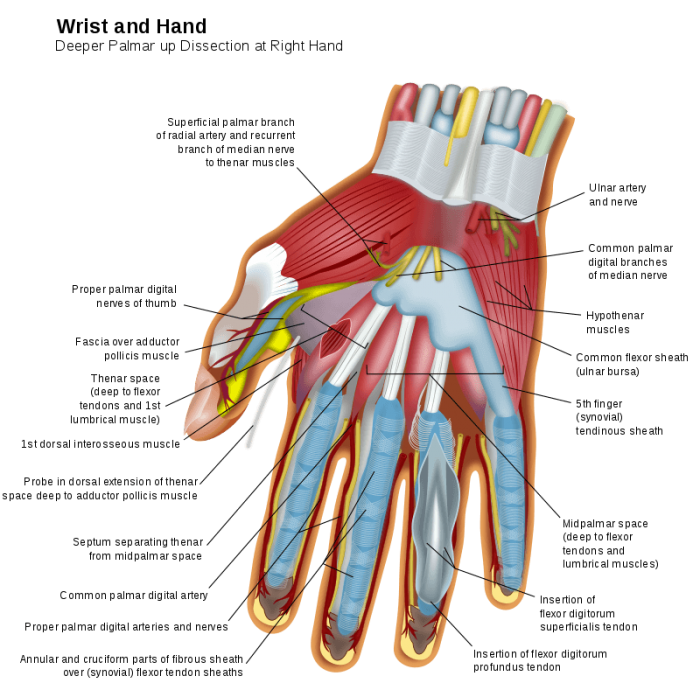 There are three major nerves found in the hand and arms. The ulnar nerve, the radial nerve, and the median nerve start in the arm or shoulder and run down into the hands. These nerves provide sensory information about things you touch and enable movement by contracting specific muscles. The ulnar nerve begins at the cervical spine, runs underneath the clavicle down to the armpit, past the inner elbow and down into the hands. A length of the ulnar nerve travels the forearm, and it is responsible for bending the ring finger and the small finger by adjusting the muscles located there. The radial nerve begins in the upper arm and runs around the rear side of the humerus. The radial nerve activates the tricep muscles, which strengthen the elbow and are located in the upper portion of the arm. 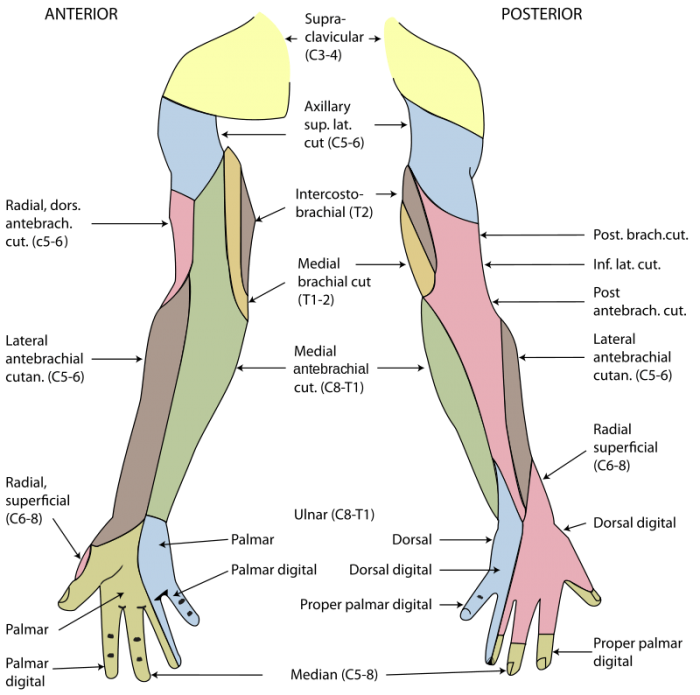 The radial nerve continues traveling downwards on the lateral side of the arm, outside the elbow, and down into the forearm where it affects the muscles that move the fingers and wrist. The median nerve starts near the neck at the cervical spine and travels underneath the clavicle and down to the elbow. The median nerve continues to follow a path down along the inside of the arm, adjacent to the brachial artery. After it crosses the elbow, the median nerve supplies the pronator muscles and the flexor muscles of the forearm which allows the fingers the band and the rest to move. Depending on who is classifying the hand, sometimes the wrist is considered part of the hand, and sometimes it isn’t. The bones in the wrist are the scaphoid, the lunate, the trapezoid, the triquetrum, the trapezium, the hamate, the capitate, and the pisiform. Collectively these are called the carpal bones. These eight small bones join the forearm and hand together. They can be organized as either three columns or two rows. The role of the carpals, and of the wrist generally, is to support the hand and to enable the use of the flexors and extensors in the forearm. Each individual carpal bone is highly mobile compared to the bones of the main hand or of the arm. The mobility of these bones means that the wrist can move frequently and easily, positioning the hand at a wide variety of different angles.